Jamaal is an emerging artist in the L.A. and Inland empire areas. He has played in concerts, shows, and contest all around Southern California Performing and well versed in a variety of styles from Reggae solos to Soloist Concertos, he is a frequent and multi talented performer. Jamaal has a degree in Musical Performance from RCC and is working now on his B.A. in Instrumental Music Education from Cal State Los Angeles. 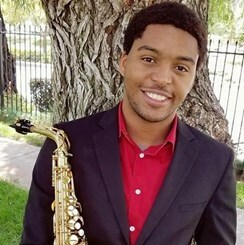 Request Lessons with Jamaal today!